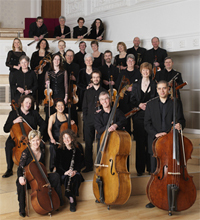 The Scottish Chamber Orchestra (SCO) was formed in 1974 with a commitment to serve the Scottish community. Now one of Scotland's foremost cultural ambassadors, it tours regularly in Europe, the Far East and the USA and is recognised for its innovatory approach to music-making and programme-planning. It performs throughout Scotland, including an annual tour of the Highlands and Islands, and appears regularly at the BBC Proms and the Edinburgh International, St Magnus, Cheltenham and Aldeburgh Festivals. The SCO's long-standing relationship with Conductor Laureate Charles Mackerras has produced many exceptional performances and recordings over the years, particularly at the Edinburgh International Festival where they have established an enviable reputation for concert performances of opera. Young British conductor Robin Ticciati takes up the post of Principal Conductor from the 2009/10 Season. Other conductors who appear regularly with the SCO include Principal Guest Conductor Olari Elts, Conductor Emeritus Joseph Swensen, Frans Brüggen, John Storgårds, Thierry Fischer, Louis Langrée and Andrew Litton. The Orchestra enjoys close relationships with many leading composers, including Sir Peter Maxwell Davies, Mark-Anthony Turnage, Sally Beamish, Einojuhani Rautavaara and James MacMillan. The Orchestra broadcasts regularly and has a discography exceeding 140 recordings.